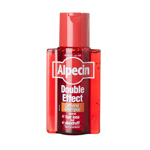 Alpecin Caffeine Shampoo C1 stimulates hair growth. 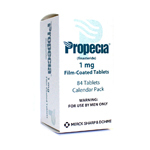 It strengthens weakened hair roots and prevents hereditary hair loss. Alpecin provides the hair roots with active caffeine and ensures vigorous, healthy hair growth. This creates better hair grip for thin, weak hair. Alpecin Caffeine Shampoo C1: Caffeine promotes hair growth and has even been proven to slow down hereditary hair loss. Now you can transport this unique active ingredient to the hair roots during daily hair washing. Alpecin Caffeine penetrates even though the shampoo is rinsed out. In just a short time (120 seconds), the active ingredient travels along the hair shaft directly into the hair follicles. If the shampoo is left on for longer, the caffeine will also penetrate into the scalp. Once a day, it will take just a small effort to ensure that the caffeine-based ingredient combination protects you from hair loss. Now you can bring this unique active ingredient to your hair roots during normal hair washing with Germany's first caffeine shampoo. There are also other reasons for men to really like this shampoo. Based on the intentional omission of softeners (e.g. silicone), the hair structure improves after just a few hair washes with enhanced hair grip. Fine and weakened hair becomes stronger and can be styled better. 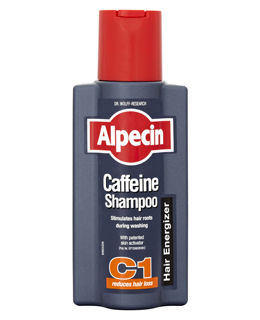 How does Alpecin Caffeine Shampoo work? 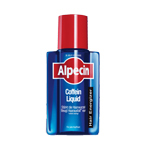 Washing hair with Alpecin Caffeine Shampoo adds active caffeine to the hair follicle. When left on for 2 minutes, caffeine penetrates the hair follicle, thereby strengthening weakened hair roots and preventing hereditary hair loss. Studies prove that caffeine penetrates the hair roots, thereby protecting the hair from negative testosterone impacts and from premature hair loss. How do I stop hair loss? First of all: hereditary hair loss is a genetic predisposition, not a disease. As such, it cannot be permanently cured but must be continuously treated. This is where Alpecin has proved valuable. The caffeine contained in Alpecin prevents the hair roots from following their hereditary propensity for increased hair loss and ensuing baldness. 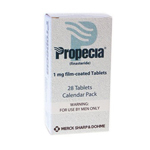 Alpecin prevents hair loss without any undesirable side effects. When applied, it causes a fresh tingling on the scalp, its active ingredients travel along the hair sheath and form a depot sufficient for up to 24 hours. Can I enhance the effect of Caffeine Shampoo, if I leave the shampoo on for longer than 2 minutes? Leaving the product on for a longer period of time also boosts caffeine absorption in the scalp. If you leave the product on the scalp for longer than 2 minutes, you should check your scalp type and scalp condition. Depending on your scalp's sensitivity, leaving the product on excessively long can result in temporary redness. Do I really have to wash my hair every day? The caffeine remains detectable in the hair for up to 24 hours. As a result, regular application of caffeine shampoo activates the hair roots in a sustainable manner, thereby creating the prerequisite for vigorous and healthy hair growth. Alternatively, you should massage Alpecin Liquid into the scalp on the days you do not wash your hair to provide your hair roots with sufficient growth energy.